Notes: The ART SCC is the ideal compact solution allowing you to take complete control of your studio space. Three selectable stereo sources can be quickly and easily routed to any or all of three sets of stereo balanced outputs from the front panel. Sources can be individually selected or blended from the front panel. Separate trim pots ensure proper levels between sources can be preset. A large single volume knob controls the overall output level of the system. Outputs would be connected to nearfield and midfield monitors or monitors and subwoofer. Multiple inputs and outputs can be used at the same time. 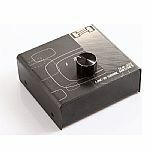 Notes: This compact switcher box allows connection of up to three stereo sound sources, to one amplifier. The sources can then be selected via the push buttons on the front of the box. 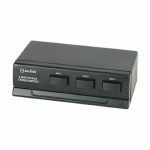 Ideal for multiple sound sources such as DVD, tuner, video player etc. Notes: With a Fostex PC-1e(B), you can remotely control the volume of both left and right speakers which makes it a great addition for music and video playback on a PC. It is compact for desktop use. 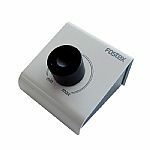 The passive type Fostex PC-1e(B) volume controller features a robust metal chassis and machined aluminum knob. It does not need a battery to power. It also comes with a stereo mini cable (80cm) and 2 RCA pin cable (100cm). Notes: With a Fostex PC-1e(W), you can remotely control the volume of both left and right speakers which makes it a great addition for music and video playback on a PC. It is compact for desktop use. 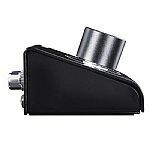 The passive type PC-1e(W) volume controller features a robust metal chassis and machined aluminum knob. It does not need battery to power. It also comes with a stereo mini cable (80cm) and 2 RCA pin cable (100cm). Notes: The Hosa SLW-333 is a passive stereo speaker selector, housed in a rugged metal enclosure, allows for noiseless switching between up to 3 x sets of powered monitors. The SLW-333 Audio Switcher by Hosa Technology provides 3 x signal routing options, eliminating the need to re-wire equipment. It is ideal for comparing an audio mix on 3 x sets of powered studio monitors, or for switching between three stereo sources on one pair of monitors. Please note: This device is intended for line-level signals only, not for speaker-level signals. Do not connect this unit between power amplifiers and speakers. 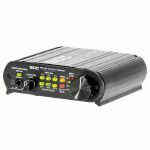 Notes: The IMG Stage Line ILA-100XLR passive stereo level control (XLR version) is designed for a precise volume control of line signals. It is used for inserting between analog signal sources and amplifiers or active speakers, e.g. between a PC sound card and active speaker systems. Notes: The Mackie Big Knob Passive Monitor Controller is the perfect addition to any studio, delivering professional source/monitor selection and precise level control that made the original Big Knob such a popular choice. Featuring an intuitive layout, the Big Knob monitor controller features balanced/unbalanced 1/4'' jack L/R source inputs, along with 1/4'' jack L/R mono outputs.